CCHR works to protect and promote human rights in Cambodia through a number of projects including 'Business and Human Rights', 'Community Training and Hearings', and 'Ending Acid Violence'. CCHR undertakes a collaborative approach to human rights, working with a variety of sectors to create change in Cambodia. Nick talks about his experience volunteering with The Cambodian Centre for Human Rights (CCHR) in Phnom Penh. This was your second time in Cambodia this year; do you have a particular fondness for the country? Yes, very much so. The plight of the poor - still desperate - affected me very much particularly when I saw the effects of the terrible Khmer Rouge regime. On top of that, the country went through a horrible civil war in the nineties, so it is still desperately struggling to get on its feet. I am now directly involved with a Cambodian family, and will be returning to the country next year. What was your family’s initial reaction when you told them that you would be volunteering? My family were delighted and very supportive. I am fortunate that I have been able to travel throughout the world in the last few years, so they are used to me being away for months at a time. Is the Cambodian work ethic similar to that of the British? Cambodians work extremely hard, in some cases just to survive. Very different to the UK, where many people seem to be work shy and know the state will support them. Cambodians have to pay for education and health care; nothing is free. Do you think the role of the accountant is understood & valued in Cambodia? Do you think they are more respectful of maturity & wisdom? I think the role of the accountant is partly understood in Cambodia, depending on the type of organisation. NGO's are obviously familiar with accountants, and mostly appreciate their worth (although maybe sometimes not enough), but many small businesses probably don't use them at all. They are certainly very respectful of age and maturity. 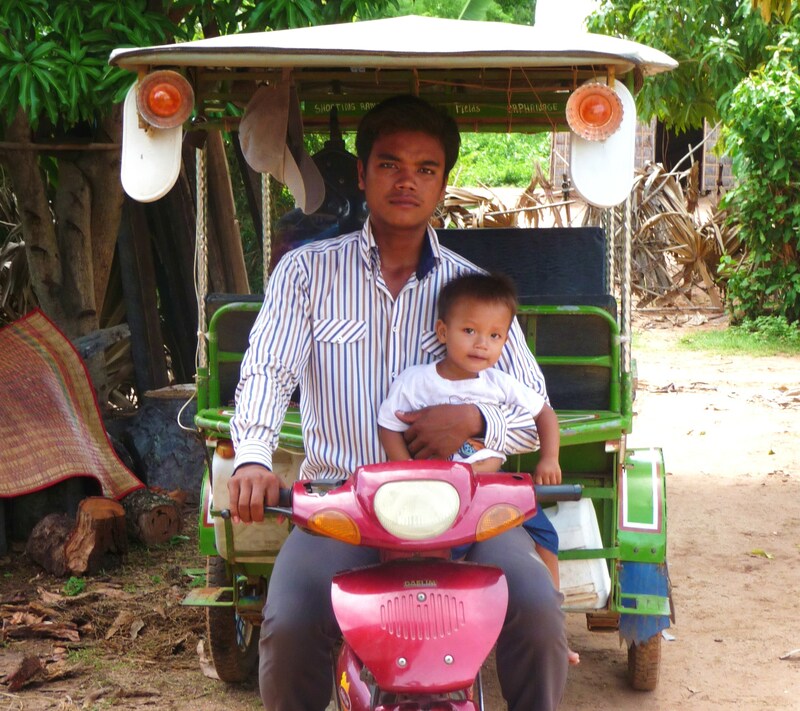 Sok Nenang your Tuk–Tuk driver brought you to his village that must have been quite an experience? Yes, it was. Although I knew they were very poor, it was still a shock to see how they live, and scratch a living from the land. No basic amenities at all, which we all take for granted in the West. How does Phnom Penh compare to your home town - is there much to see and do when you weren’t working? You cannot compare Phnom Penh with any town in the UK, it's a humid, noisy, hectic melting pot of humanity, full of motor bikes and tuk-tuks, and an increasing number of hugely expensive foreign cars bought by the rich, but still an attractive city with some old colonial buildings, beautiful royal palaces, temples etc. The last 10 years have seen a big improvement in the city's infrastructure and facilities. I went to numerous restaurants in the evenings, many of them very cheap and extremely good - the local Khmer food is delicious. I had done most of the tourist stuff in January when I was there, but there is plenty to see for a newcomer. After you finished your placement you went on to visit relatives in Australia, was it easy to build this into your travel itinerary? Now that you’ve had time to reflect, what would you say you learnt most from your time in Cambodia? I very much enjoyed my interaction with the Cambodian employees with whom I was working, and have happy memories of our daily lunches together at a local Khmer restaurant ($1.50 per day). They were very friendly, and presented me with a lovely gift when I departed. My most lasting memory will have to be the times I spent in the village about 30k from Phnom Penh. I will never forget those times. Do you think the experienced changed you in any way? Probably not with regard to the work, although it helped my understanding of how NGO's operate. My on-going involvement with the village family is in fact a repeat of something I have been doing in East Africa for the last 16 years. I now want to encourage my children to do something similar when they can, although family commitments will mean they will have to wait a few years. Would you recommend this experience to other accountants like yourself wishing to take on this challenge? What advice would you give them? Most certainly - nothing to lose and everything to gain. Do not go on an assignment with too many pre-conceived ideas of what is required. Don't expect work to proceed at the sort of pace we are used to in the UK, and interact as much as possible with the local people. Try to make contacts with other volunteers, who can help you to learn much about the work place, the people and customs, social life, restaurants etc.